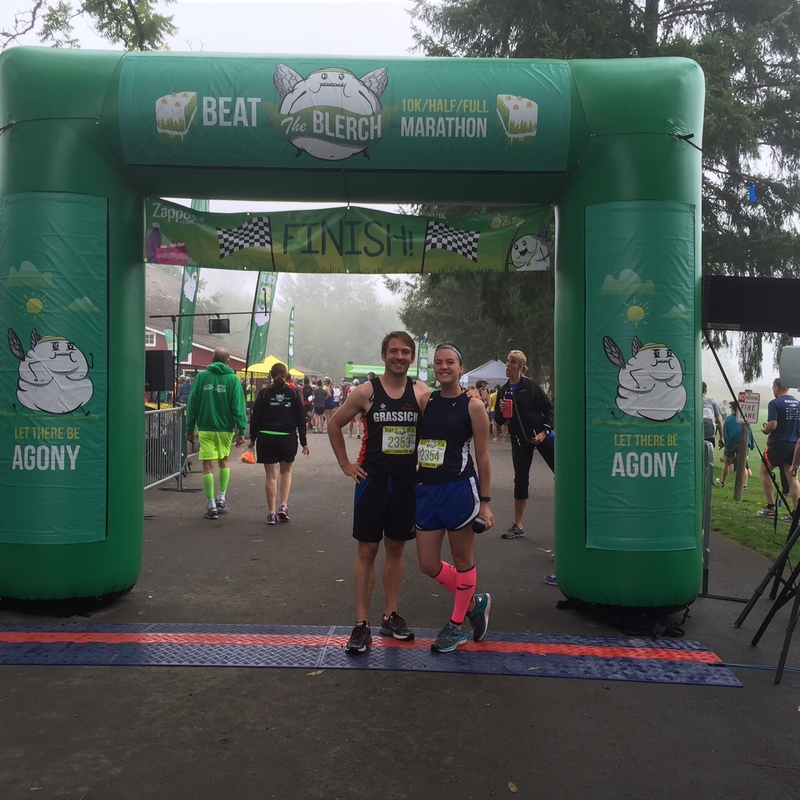 Saturday, September 12, 2015, Mark and I ran the Beat the Blerch Half Marathon in Carnation, WA. 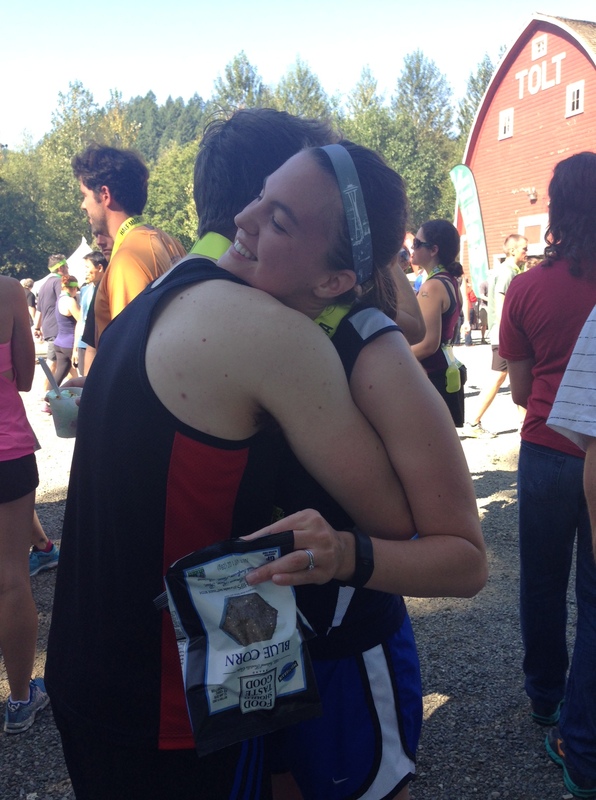 This was my second half marathon and wanted to give a little recap of how everything went. 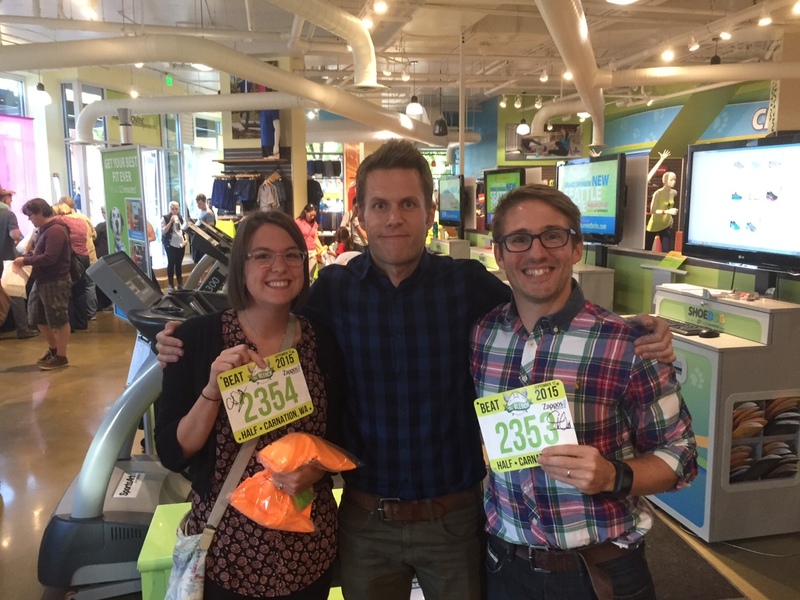 On Thursday, we went to Green Lake Road Runners Sports to collect our packets. We were expecting a huge line to collect and to meet Matt Inman (the Oatmeal), but were pleasantly surprised when we arrived and we were able to get our packets right away. There also wasn’t a line to meet Matt Inman, so we bought his new card game Exploding Kittens (not safe for work edition) and we got Matt to sign it, as well as our bibs. We were also able to get the co-creator of the game to sign our game box as well. Matt was the official nerd that I thought he was going to be. Was pretty quiet, but very friendly overall. He and Mark had a little conversation which was something to brag about to our fellow nerd friends. Here we are with him. On the day of the race, we left our apartment at 7:45am in order to get parking for the 9:30am start time. There was traffic going into Tolt McDonald Park where the race took place, but luckily we were able to find parking next to a baseball field which was about 1/3 mile away from the race start and was actually right on the course. We wandered around the start line killing some time and soaking up the experience before the race start. At exactly 9:30am, the race began. There was no sort of corralling for pace times so everyone just gathered in a pack and the wave start begin. The first mile was spent on gravel and trying to navigate around people. I was trying to run at my pace but had trouble getting into a rhythm with having to run around the people and trying not to roll my ankle on the gravel. Unfortunately the gravel remained for the first 3 miles of the course until it become more of a dirt trail run. This definitely lead to me expending a lot of my energy. As I had read about the previous year, it was a pretty large incline from the start of the course to the turn around point (800 ft. elevation gain). I had to stop to drink some of my water every mile for the first 4 miles which was a bit of a frustration as I was trying to beat my PB from last year. There were water stops at mile 3, 6, 7.2 and 10. As the run was going on, the hotter it got outside. 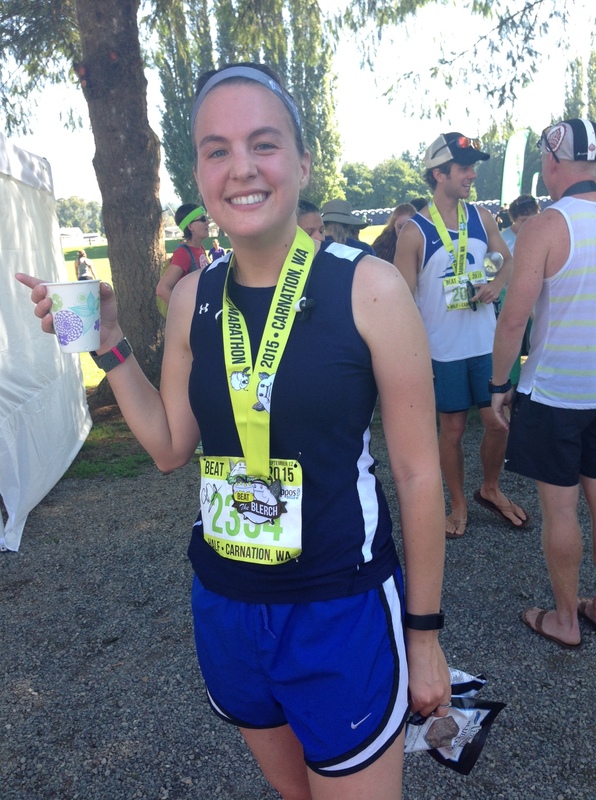 Luckily most of the course was shaded, but the heat definitely was an added factor to the race. Also a little TMI, but due to my active ulcerative colitis, I had some urgency starting at mile 6 and had it through to the end of the race. There were lines at each of the few porta-potties and I did not want to have to wait in the lines as I knew that it would affect my time. I continued the race clenching till the end. After the turnaround point, it was a nice downhill till about mile 11.5 when things seemed to even out and the running started to get harder. As an added frustrating the gravel was back (since it was an out an back) and I had caught up to the walkers of the 10K race. I pushed on through but although I do admit that I had to stop a couple of times to get some water and stretch my hip flexors as they were taking a bit of a beating and I was having to navigate around the 4-5 people wide walkers around me. I crossed the finish line in 2 hrs. 20 min 6 seconds. This is 12 seconds slower than my first half Marathon. I am pretty disappointed that I wasn’t able to beat the time, but was proud of myself for finishing the race and running it to the best of my ability. 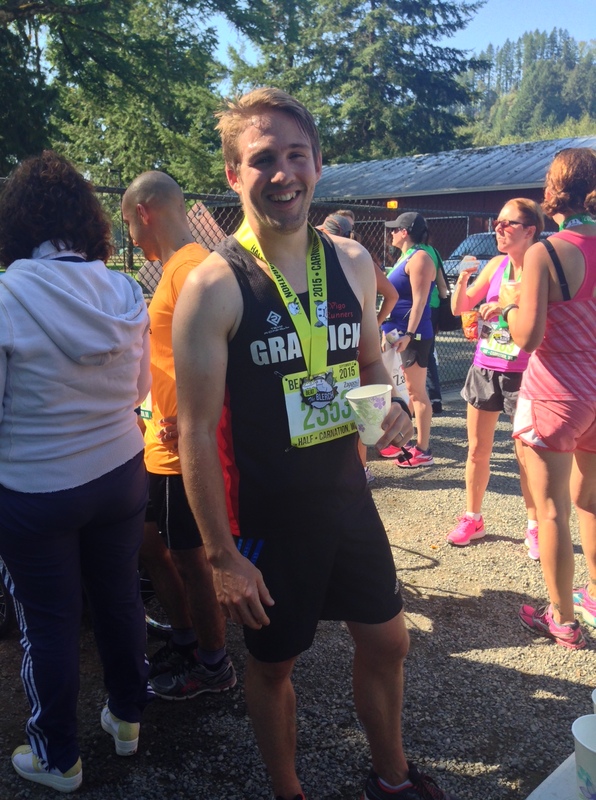 Mark killed his goal time and was able to finish in 1 hr 45 min, making him in the Top 50 for the race. 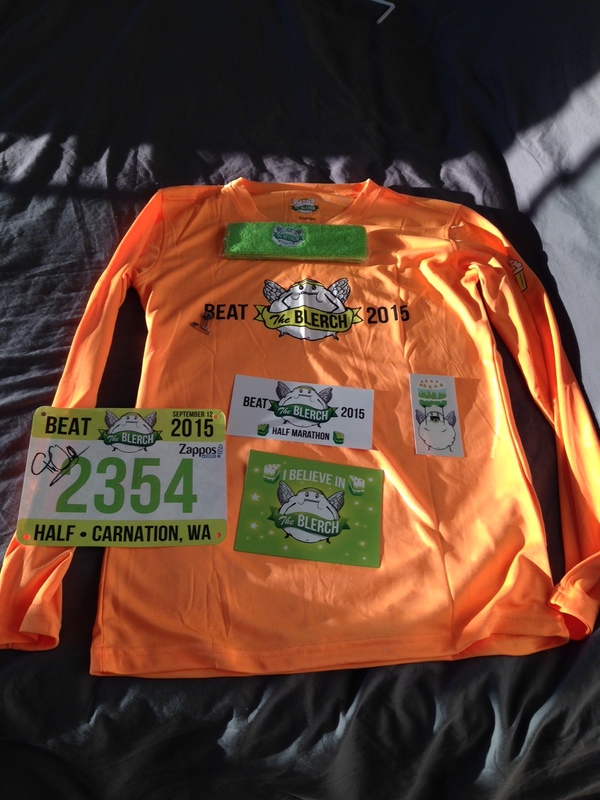 Would I do the race again next year? Maybe. I like the thought of the race, but due to its small nature, I feel like I missed out on more water stops, porta potties and overall crowd involvement that you get in the larger races. Also, not having a wave start with your pace as well as pace runners was something that I missed. Mark definitely said that he will do this race again next year. He loves the out and back incline/decline and loved the fact that it was a trail run.